A while ago I had this idea. As a kid I was really intrigued by nativity sets. Because of that I often made my own set. I thought it would be fun to craft my own set. And why not share it? You can do this yourself or let your kids (6+) get crafty. Have fun! - Go to my new website and download the PDF. - Print the 2 pages on thick paper or thin cardboard. Set your print quality to high, for better details. - Cut out the figures. - Glue them and voila! Copyright of these designs by Marloes de Vries. It's not allowed to claim these designs as your own. Wat een leukertjes!!!! Ik ga ze met Edward knippen, print ik ze wel een keer voor hem en voor mij uit, knippen met een kindje van twee is toch een echte uitdaging, hihi. @ Nancy Kers: Ja, dat knippen is een precies werkje, toch wel lastig voor een 2-jarige denk ik! Maar ik ben blij dat je ze leuk vindt! Ik knutselde ook altijd, alleen ik had niemand om het samen mee te doen (mijn familie is niet echt creatief). ik ga het op school doen,samen met de kinderen van groep 4. Wat leuk! En tof dat je ermee in de 101 Woonideeen staat. Gefeliciteerd. Helemaal super. Zit nu met iPad maar die ga ik morgen met computer zeker pinnen. Dank je wel! Erg leuk. Misschien een idee om zondere kleuren te plaatsen? Kunnen kinderen ze zelf inkleuren. Maar hier ook blij mee. Dank! Wow, Marloes, this is not only very generous of you to give this PDF but also very beautiful! I will do this with my girls as they will surely have fun coloring in there own crib! Thank you so very much and have a lovely creative week!!! Super leuk! Ik ga ze straks na Sinterklaas gelijk maken met mijn dochters.Ook een leuk idee voor bij hun op school, om in de klas te maken. Dank jullie wel, voor de leuke comments! Thanks for all the lovely comments! Wat een mooie printable. Ik heb er gelijk een blog over geschreven: http://djello-maureen.blogspot.com/2011/12/knutsel-en-kleur-je-eigen-kerststal.html Dank je wel! Dank je wel Maureen! Erg leuk! Thank you! These are really fun. Perfect!!! I am referring to your free printable on my blog!!! and will make them tomorrow with my two kids! Thank you for sharing! thank you so much these are precious! i can't wait to make these with my grandson. My daughter will love to create those with me. I hope it is okay with you, that I linked to your blog on my blog. Thank you so very much for sharing this adorable project. I am going to have my 8 and 9 year olds make these this weekend at Religious ed class. So cute! Looking forward to doing them with my daughter, it will be a fun craft over what promises to be a very rainy Christmas here in New Zealand. God bless you for your generosity and or helping us celebrate the real meaning of Chris-mas! I just printed out the form. THANK YOU! this is awesome! Hello Marloes, I follow you from Italy, can I refer to your beautiful crib in my blog? thank you so much, it's really lovely. Done!!! :o) and tanks again! Thank you so much for sharing your talents! I love it, and so will my 2 year old daughter! These are adorable! Thanks so much for sharing your talent. My kids are very excited to make these. Thank you, I made them today with my 3 year old daughter, we had so much fun and they look great. what a fun to make this family. Es ist wundervoll! Vielen lieben dank fürs teilen mit uns. Habe gleich beide ausgedruckt und werde sie mit den Kindern basteln! I'm taking them with us in our campervan, we leave tomorrow and this will add some xmas spirit! Wat leuk Marloes! Bedankt. Dit stalletje komt onder onze kerstboom. En ik vertel het voort! I love it... especially because I don't have one at the moment! Oh wat goed zeg, geweldig!! Ga ze meteen voor mijn meiden uitprinten! Lovely gonna make them with my kids!!! Thank you for sharing! They are precious. thank you so much for sharing! sending a copy to my daughter in law too! Thank you so much for sharing this with the world. My family is so excited for this - Merry Christmas! Thank you all for the lovely, wonderful comments! I'm so happy so many people enjoy this set! @ Rose: Can you please try again? The links seem to be working. They are beautiful, thank you for sharing. Thank you! We had a lovely time making these today when the cousins came over here in Utah. Thank you for sharing. Have a Merry Christmas! That is my problem, too. I can´t download it. Can you fix it? I have added some links to the files on Wetransfer. So if the Box download doesn't work for you, please try the other link. Hoi Marloes, allebei de links voor de ingekleurde variant zijn van the box... dus hij doet het nog niet... en ik wil ze zo graag maken, want ze zijn zo leuk! My 7 year old has kept busy all day coloring and cutting these to give as a gift to his grandparents. I couldn't download them either, but they printed right from the download page. Thank you and Merry Christmas! Wetransfer Link for the pre-coloured PDF is wrong. please check. Het klopt dat de ingekleurde PFD beide geopend worden in Box ipv Wetransfer. Ze zijn enig en ook ik zou ze graag willen maken met de kids in de kerstvakantie. Hopelijk kan het opgelost worden. Dank je wel alvast voor het delen hiervan! I think everything is resolved now. I hope it works. If not, please let me know! Thank you. It's so cute!!!! ...ooh, wat jammer dat ik zo laat ben! Zo leuk dit, ik heb een linkje op mijn blog geplaatst naar jou. Ik hoop dat je dat goed vindt! Ik ben altijd op zoek naar mooie ideeën die weer kunnen aanzetten tot nieuwe inzichten. Deze knutselplaten vindt ik weer zo'n voorbeeld. Prachtig! Amazing! Thank you! Merry Christmas from Madrid!! My kids will love this--very kind and gracious of you! Thank you!! Merry Christmas! My grand kids will love this,thanks. thank you so much! I'm spending Christmas with my grandchildren in Hawaii. They will love this! God bless you, and Merry Christmas! Thank you! I will use this for my class on Sunday! The links are working properly. Please check if your internet connection is on. There might be a problem with your browser. Thank you for sharing this file, it is really appreciated. Uh oh! You are out of bandwidth! I was hoping to download for my nephew to do tomorrow. Merry Christmas! Hi Rosalie, I have re-uploaded the files. It should be working now. Thank you! 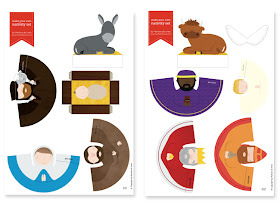 I am using these figures for my daughter's Nativity in a shoe box scene - a school project. Thank you very much for posting these. They are the best templates I have found on the web so far ! how cute! 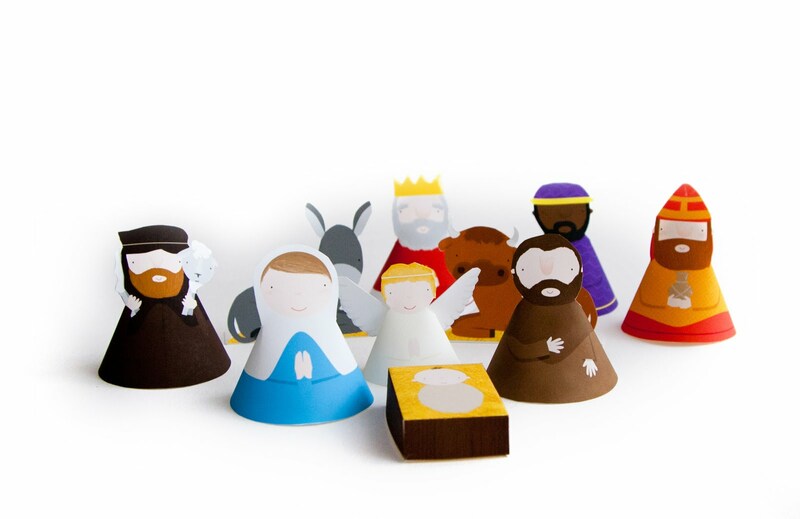 thanks for sharing, I've just downloaded the file and can't wait to prepare the nativity set. Brilliant! thanks so much for sharing it! I'm sure my son will love colouring in and help me glue them up! olive wood nativity sets are attractive enough to display in your home all year! Why pack them away? Thanks for sharing. Are you the one who made the illustrations? I will be making this a weekend activity for my son. Great! Thanks again. Thank you again! These are perfect to send to my sponsor children.